Tat soi is native to China and widely cultivated in Japan, it is considered an ancient green. Tat soi also goes by other names such as flat cabbage, spoon cabbage or rosette bok choy. It’s a member of the brassica family along with broccoli, collard greens, brussels sprouts and kale. 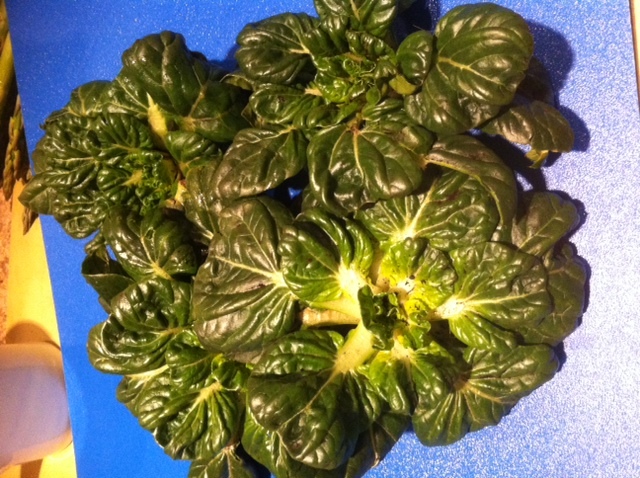 Tat soi is most similar in taste to mustard greens (although not as strong) and in texture to bok choy. Mix first 7 ingredients in medium glass bowl. Season sauce to taste with salt and pepper. (Sauce can be prepared 2 days ahead. Cover and refrigerate. )Prepare barbecue (medium-high heat). Place carrot in medium bowl. Cover with ice water. Let stand 15 minutes, then drain well. Spray fish on both sides with Pam. Sprinkle with salt and pepper. Grill until just opaque in center, about 4 minutes per side.Meanwhile, heat large nonstick skillet over medium heat, spray with Pam. Add shallot; stir 1 minute. Add tatsoi; sprinkle with salt. Toss until tatsoi is wilted but still bright green, about 2 minutes; divide among 4 plates.Place fish atop tatsoi. Sprinkle each fillet with carrot; drizzle each with 2 tablespoons sauce. Serve, passing remaining sauce separately. Never had Tatsoi but I do like Spinach… Sounds like a great recipe. What’s the purpose for all of the spinach/tat soi in your diet versus another leafy green? My frustration is that it cooks down to nothing so one bag from Trader Js is good for one meal with barely enough to share, and is not cheap! Hi Elizabeth! There are many reasons why spinach is described in my diet. Spinach is one of the most nutrient dense vegetables of all the leafy greens, contains a lot of iron and fiber and is a natural diuretic (helps the body shed water), and also a muscle building vegetable. It is also rich in omega-3 fatty acids, something needed in a bodybuilding diet in addition to nutrients preventing osteoporosis, a condition many women with low body fat following a strict diet such as myself, can end up suffering from. Spinach is filling as well, and contains a lot of vitamin A, C, B and K. So.. as you can see – provides a lot of positive effects but I agree with you – it’s frustrating that it cooks down so much! luckily I get easy access to fresh spinach from the farmers markets we do, so I always make sure I stock up. I will be substituting with tat soi whenever I can though just to get a change!